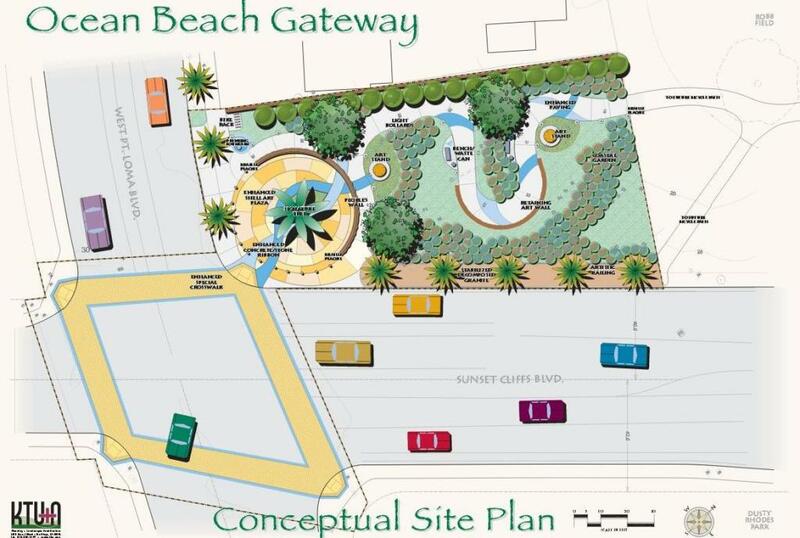 The city has given an extension to Phase II of the Ocean Beach Entryway Project, meaning the plan is to have the project done by the end of 2014. It was originally scheduled to be finished by the end of this year, but budgeting problems threatened to entirely derail the plan. “That project has been going on for many, many, years, and this is the last piece of it,” he said. Perrotti said he was notified “within the last week” of the delay to the final phase of the project, which he says will be the end of a years-long push to improve the look of the entrance to OB. It includes completion of what is known as Gateway Park, a stretch of land that connects Robb Field to Sunset Cliffs Boulevard. According to the OBCDC website, the total cost for the second phase of the project is $219,000. But that number doesn’t seem to be an accurate assessment of the project’s actual costs. A letter sent to Perrotti last month by James Nagelvoort, the city’s Assistant Director of Public Works, said the bidding process for the project yielded only one contractor. The letter from Nagelvoort said the estimated cost from the bidding contractor was $275,000 – and that the entire cost of the project would be $400,000. She said they were hoping to get the funding approved by the City Council in February and have the project completed by the summer. When it is done, there will be a path down the hill to Robb Field, as well as enhanced paving, a retaining art wall with tiles and seashells and an enhanced crosswalk on Sunset Cliffs and West Point Loma boulevards. Town Council president Gretchen Newsom expressed her frustration with the delay of the project. “We’ve been promised for many months that they were going to break ground in October and then be done no later than year end,” Newsom said. This is the same park area that the OB Rag and Green Store organized a clean-up at over a year ago due to city and community neglect. Just how long has this been going on? There are two signs at the bottom of the hill adjacent to Robb Field – the area that included the final phase of the project. One is a sign with information about the project which says the total cost is $435,037. It also lists Gerry Sanders as the city’s mayor. On the other sign is a quote from Councilman Kevin Faulconer that says “We did it!” That has been tagged over by graffiti. Taking the high road when asked about who was at fault for the delays, Perrotti said he was just happy to have the project move forward. Sorry, still have to chime in on the fact that the archaeology firm I worked for at the time, Laguna Mountain Environmental, (I did ALL the lab work on this), did all the mitigating archaeology on this project and while we were paid about $40k for the initial work, we were still owed over $140,000 for this job. Native Landscaping hired us and they declared bankruptcy and we were left in the dust. Pardon the pun. We never saw another penny and I do believe they never even received the final report on this. That means over 10 archaeologists worked on this project and our boss paid us from other money. It’s part of the reason why I lost my job eventually and Laguna Mountain went down to just a couple of employees and barely exists anymore. I worked there for 3 yrs. This job really hurt us. And still, it is not finished. Ridiculous. The saddest part? This is an archaeological site. A piece of history. But for anyone thinking there are cool artifacts on this site to go digging for, it was a shell midden, shows us what the Natives ate. I haven’t heard this part of the story. Did the 40k they paid and the 140k they were supposed to pay come from the project budget? I thought it was finished and they just did a really bad job. So I guess I can at least take it as a positive that they’re not finished. Do I understand this? If the entire cost of the project is $400,ooo, and the path and plants are $275,000, then the city spent $125,000 to design a path and specify the plants. I have forgotten what the top part cost, so many million give or take a few. Doesn’t $275,000 for a path and some plants sound like a lot of money to you? I mean, that money was OUR money at one time. (I learned to do this by doing the little “Submit”tests Frank gives us to submit our comments). Its a lot but I would expect it would be higher. $45k was spent on the 14 benches on sunset cliffs, apparently with no money saved for maintenance. Do not forget the cost to buy out the pizza parlor/land. I was only the asst lab manager on this project, I did not work on the biz part. I just remember my boss constantly meeting with the city trying to get our money and it just never happened. I know that Native Landscaping was part of the reason we didn’t get our full payment, but other than knowing they declared bankruptcy, I couldn’t tell you much more and I don’t work for this company (Laguna Mtn Enviro) anymore. But they did partially fold because of this project. I love my little town, but that project makes me grimace every time I have to drive by it….which is pretty much every day! If the CDC had hired Kip “of Voltaire” Kreuger this corner would have started looking good a long time ago. This is what happens you have all dollars and no cents. The Voltaire Park crowd had all cents and no dollars. Sad to hear this is delayed again. In 2012 we fought really hard to save a bunch of CDBG money that was going to be reprogrammed back to the federal government because the City simply “couldn’t spend it” on this project. We pushed the City hard to get this project cooking, and got a year extension on the CDBG funding, as well as an understanding that the City would complete this in time. I wonder if that is all a loss now and the City will end up paying even more for this project. Advice: Pursue selling memorial benches along the pathway to cover some needed money! Could also work with Coastkeeper/Surfrider to have them do the planting for free, would be a great example of their Ocean Friendly Garden Campaign they are pushing throughout OB/PL.